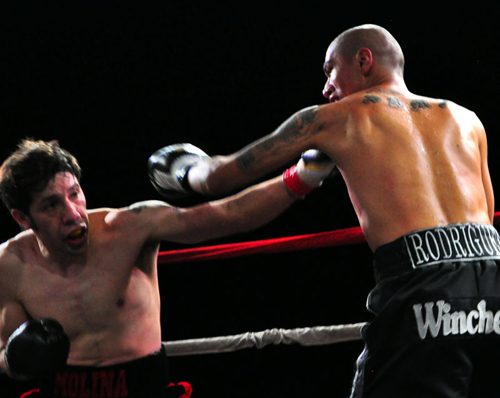 Photos: German Villasenor Team Molina/Showdown Promotions. John ''the Gladiator'' Molina (22-1, 18KOs) won the vacant WBC USNBC Lightweight belt in front an outdoor setting and very lively crowd in three heats of action. Molina, now (22-1, 18KOs) dropped his game challenger, Guadalajara, Mexico's Alejandro Rodriguez (12-3, 6KOs) three times, once at the end of the first round, and twice more in the third round, with Rodriguez' corner calling for the stoppage, with the referee calling the action off at 1:45 of the round. 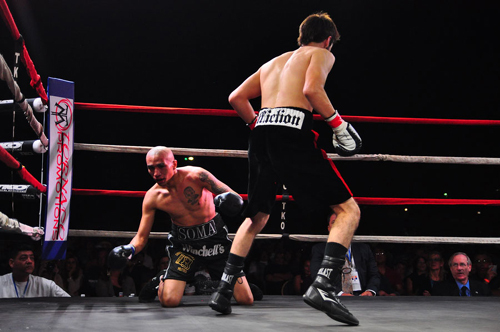 On the co-feature Bantamweight Hanzel Martines (Antonio Margarito's brother-in-law) brought the fans to their feet with a wicked stoppage, with a head shot against a shifty, quick handed Omar Gonzales 2-6 in the fourth round of a scheduled six. Gonzales, dizzy, tried to beat the count, in no shape to continue, the referee wisely saw fit to call the bout off at 2:33 of the round. In other results, Big Welterweight Juan Gonzalez won his pro-debut by scoring a TKO win over another pro-debuter in Edward Garcia at 2:33 of the first stanza. Heavyweight Enrique Lobatos 3-2-1 (2KOs) scored his second stoppage by halting Blu Delong 1-1 at 2:54 of the second round with abody shot. Welterweight Jonathon Garcia 5-0 (4KOs) dropped Stephen Rubalcava two-times in the first round, scoring the TKO victory at 1:20 of the first round. In the first fight of the night, Featherweight Daniel Franco2-2-1 (1KO) scored a hard-fought four round majority decision against Jose Sandoval 1-0-1, 0Kos. Scores were 38-38 (twice) and 39-37 for the majority decision. In attendance were the three-time welterweight champion Antonio Margarito Jesus Soto-Karass and former WBA Superflyweight champion Martin ''Gallito'' Castillo. Classy Thomas Trieber handled the announcing duties.